We provide teachers with free materials that fill critical resource gaps, build classroom libraries, and make it easy to engage and educate students. We offer thousands of grab-and-go lesson plans, discussion guides, extension activities, and teacher tool-kits. We often team up with companies on these materials and are thrilled to have recently launched #CyberSmarts, a new collaboration with Norton LifeLock and Symantec. According to Common Sense Media, kids aged eight to 12 spend an average of six hours a day online and face issues like identity theft, cyberbullying, and cyber predators. Like other important safety lessons, we need to educate kids at home and at school to help them spot the risks of being constantly connected. Criminals often target kids through “fan sites” that contain malicious links or offer free music, movies or video game skins that a child might be tempted to download. More than 1 million children were victims of identity theft or fraud in 2017, according to a report from Javelin Strategy & Research. The best way to fight cyber criminals is through education, and that can start at any age. 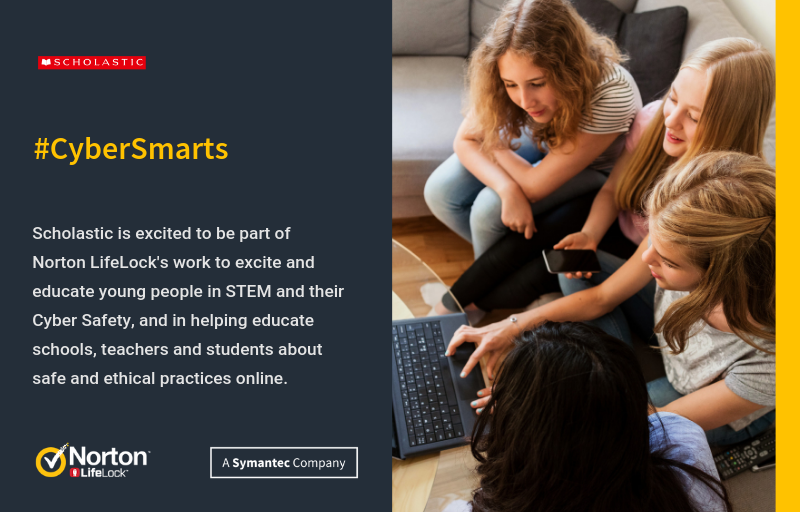 Learn more about Symantec’s commitment to STEM education and digital safety in their 2018 Corporate Responsibility Report and learn more how Scholastic encourages the intellectual and personal growth of all children on our website.